Wake up and learn about the blockchain. It could run your life. It’s time to wake up and see what is coming. The future is intriguing, brilliant, somewhat scary, and it is coming at breakneck speed that most of our lawmakers don’t see or get. The revolution is the blockchain. You know it as cryptocurrency. Many of you have heard of Bitcoin. But that is merely the tip of the digital iceberg. 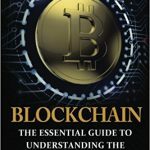 Read this book to get started: Blockchain: The Essential Guide to Understanding the Blockchain Revolution by Jeff Reed. This will get you started. It is not a long read; two dog walking sessions and a couple of workouts for me. And Reed offers simple, easy to understand explanations for what is a different way of thinking about money and how we do business. Sure cryptocurrency has had bad press. But that is changing because the technology is getting better. Banks, governments, corporations, and law enforcement are beginning to embrace it. Singapore just tokenized the blockchain for their currency. Cryptocurrency is on a peer-to-peer platform so transactions are done between two people with no third party involved. That takes the power of money away from the bankers and governments. It will save costs and make transactions easier. It could keep governments in check who want to devalue currency to fight wars or create economic wars. Cryptocurrency is highly secure so it makes hacking difficult and easy to detect. But it also gives the owner of the currency privacy; that can be good for the average law abiding citizen but bad when you consider nefarious types wanting to stay in the shadows. Bitcoin will probably lose its popularity to a newcomer blockchain called Ethereum. At the foundation of Ethereum is smart contracts that transact, record, and enforce every transaction — or event — in our lives like a birth certificate, a marriage license. It might be the way we vote. It will change real estate. Your sale of a property will be permanently recorded and you won’t need a “title search firm” any more. Databases – for businesses — will automatically update across many computers. You won’t need data entry folks. Now think about this. Take those future job losses from blockchain then add them to the E-commerce craze that could be killing nearly 5-million jobs in retail – in this year alone. A good site to follow to learn more on all this is: Bitcoin News. Some disclosure here: I am working with a new company that will be offering a blockchain option, along with e-commerce and travel in the near future. Through my work, I have done a ton of research and to me, even if I wasn’t working with a company like this, I would tell you this is future. Understand that e-commerce and blockchain are taking over. You need to be ahead of it or get run over by it.